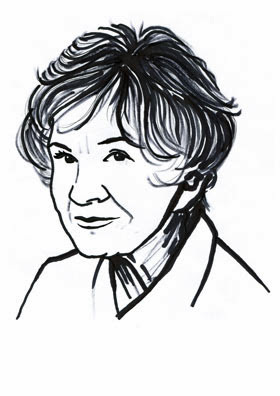 The Nobel Prize in Literature 2013 was awarded to Alice Munro"master of the contemporary short story". Munro started writing stories in her teens, but published her first book-length work in 1968, the story collection Dance of the Happy Shades, which received considerable attention in Canada. She had begun publishing in various magazines from the beginning of the 1950's. In 1971 she published a collection of stories entitled Lives of Girls and Women, which critics have described as a Bildungsroman. Munro is primarily known for her short stories and has published many collections over the years. Her works include Who Do You Think You Are? (1978), The Moons of Jupiter (1982), Runaway (2004), The View from Castle Rock(2006) and Too Much Happiness (2009). The collection Hateship, Friendship, Courtship, Loveship, Marriage (2001) became the basis of the film Away from Her from 2006, directed by Sarah Polley. Her most recent collection is Dear Life(2012). Munro is acclaimed for her finely tuned storytelling, which is characterized by clarity and psychological realism. Some critics consider her a Canadian Chekhov. Her stories are often set in small town environments, where the struggle for a socially acceptable existence often results in strained relationships and moral conflicts – problems that stem from generational differences and colliding life ambitions. Her texts often feature depictions of everyday but decisive events, epiphanies of a kind, that illuminate the surrounding story and let existential questions appear in a flash of lightning.